MUHC personnel may access UpToDate’s clinical content via the UpToDate mobile app (available for Apple iOS, Android and Windows 8). To do so, you must first confirm that you are affiliated with the MUHC or McGill University by registering for an UpToDate account. Registration must be done from a networked computer (non-McGill hospital based staff) or via EZProxy (McGill only). 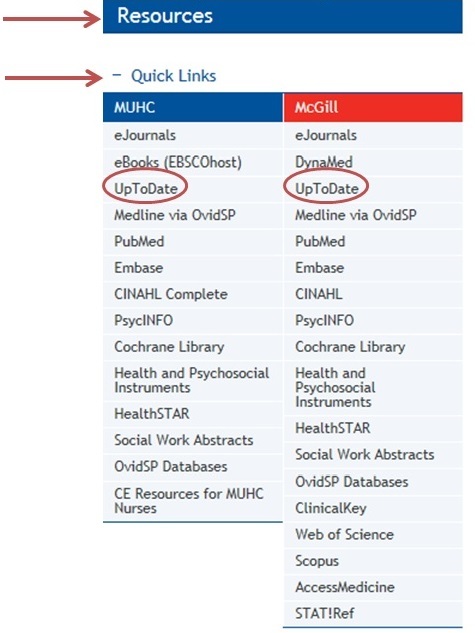 Select UpToDate via the MUHC Libraries website from the Quick Links menu. If you are non-McGill hospital based staff, please use the link in the MUHC column or if you have a valid McGill university email address, please use the link in the McGill column. On the UpToDate website, click on Log In / Register, at the top right of the page. Note you may need to click more than once to see the Registration page. Otherwise, you may use one of the following links. 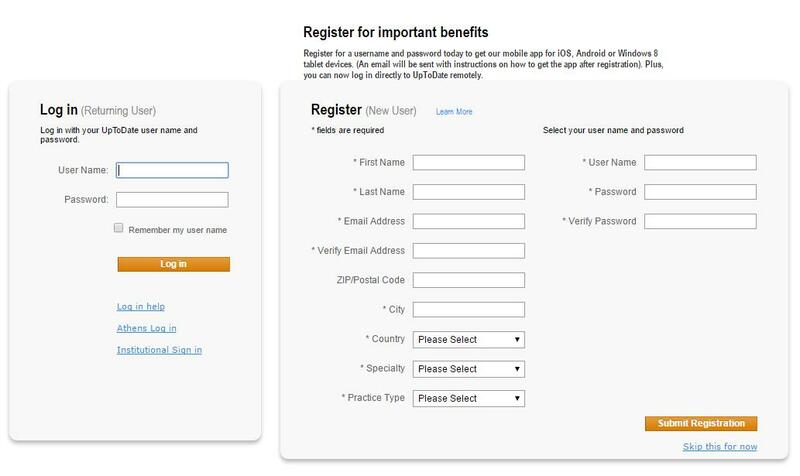 Register as a new user by completing all fields and clicking on “Submit Registration”. Once registered, you should receive an email with your chosen UpToDate username and instructions on how to download the app. If you do not receive an e-mail, you may still download the UpToDate mobile app for your device and login with the registration information you have submitted. Please note that you will need to re-confirm that you are affiliated with the MUHC or McGill by logging into your UpToDate account from a networked computer (non-McGill hospital based staff) or via EZProxy (McGill only) every 90 days. For more information about UpToDate, contact your hospital librarian.